Times Now TV channel, part of the Times Group media behemoth, has one of the worst reputation in the aviation industry for its scaremongering reporting and blowing the smallest of molehills into the largest of mountains. After the tragic air crash in Mangalore, the nation was close to yet another major air disaster, which was fortunately averted by an alert ATC. TIMES NOW on Thursday (May 27) accessed the exclusive details of this very close shave that occurred last night. The video broadcast of the story shows how far the channel is willing to go in search of Target Rating Points (TRPs). A dispassionate report of the incident. An IndiGo Airbus A320-232, registration VT-INK performing flight 6E-415 from Mumbai to Bangalore (India), was cleared to taxi on inactive runway 14 to taxiway N1 (which is parallel to the then active runway 09/27), on to the holding point of runway 27. 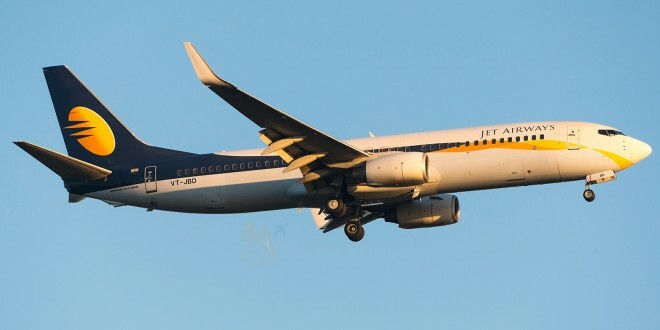 At the same time a Jet Airways Boeing 737-700(WL) VT-JGX performing flight 9W-616 from Kolkata to Mumbai, was on final approach to runway 27 being cleared to land on the runway and about 1nm (2km) from touchdown at a height of 400 feet at around 21:04 (15:34Z). The IndiGo Airbus missed the turn from Runway 14 on to taxiway N1 and approached the intersection of the two runways instead. The tower recognised the conflict and ordered the Jet Airways flight to go around. 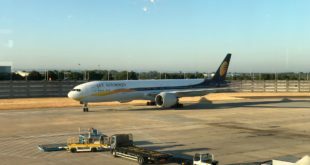 The Jet Airways aircraft landed safely on their second approach, and the Indigo Airbus performed a normal take-off to reach Bangalore safely without further incident. 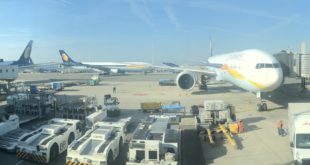 The airport operator Mumbai International Airport Ltd. (MIAL) admitted that the taxiway and signage lighting of taxiway N1 was faulty and was not functioning at the time. MIAL also claims to have informed the ATC about the fault. It is unclear why no “Follow Me” vehicle was guiding the IndiGo airplane since two other departures prior to the IndiGo flight had been provided with a “Follow Me” vehicle to taxi to the holding point of runway 27. IndiGo President Aditya Ghosh said, that their crew overshot the taxiway N1 because there were no lights. As soon as they recognized they had overshot the taxiway the crew coordinated with the ATC and stopped well short of the live runway 09/27. The Directorate General of Civil Aviation have ordered an investigation but the hot potato of responsibility to the fault is already being passed around between the airport operator MIAL, the ATC run by the Airports Authority of India, and the airline, IndiGo. MIAL claims it was the ATC’s responsibility to inform the airline of the faulty lights and advise them to use a “Follow-me” vehicle. It is possible the commander of the IndiGo flight may have declined the vehicle. One fails to appreciate what Times Now TV aims to achieve with its scaremongering reporting. This sensationalist reporting habit seems to have even entered the newspaper domain with the normally sober Hindustan Times. The inaccuracies in their report leaves us shaking our heads and wondering why the HT reporters do not take some cues on the excellent aviation sector reporting by their colleagues at group newspaper The Mint. If anything, this brand of reporting has scared all aviation stake-holders in to clamming-up and trying to suppress even basic simple facts which they fear will be taken out of context and blown out of proportion. Getting even the simplest of information like aircraft registration numbers has become a chore and suppresses the efforts of more responsible reporters. Only one airline seems to escape the Times Group airline bashing crusade — Kingfisher Airlines. One can probably attribute it to the good relations Kingfisher boss, Dr. Mallya is known to have with the Jain brothers, owners of Times Group.